Legend has it that Phaethon, son of Helios, sought proof that he was indeed the sun god’s progeny. Helios relented to Phaethon’s request and allowed him to pilot the sun chariot across the sky. Phaethon was unable to control the horses that pulled the chariot, and seeing the chariot veer off course in danger of setting the earth on fire; Zeus struck down Phaethon with a lightning bolt. Phaethon’s lifeless body fell to earth, landing along the banks of the River Eridanos. Phaethon’s sisters, the Heliades, gathered around his body and transformed poplars. Into eternity they weep tears of electron (amber) at their brother’s grave. Our fall Decograph Special Edition 1702, draws on the tale of the Heliades tears. 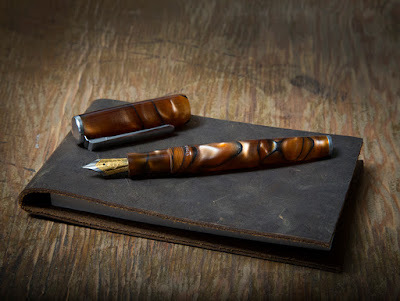 The rich amber hue of the acrylic swirled with dark lines reminiscent of poplar bark that’s cut with an iridescent line that suggests the path of a tear. The color brings visions of the fall with its brownish-orange shade often seen with the change of seasons as autumn meets winter. The 1702 – Elektron special edition is limited to 60 pieces, each elegantly laser marked on the barrel with sequential numbers. Each pen ships in our custom made and marked pen capsule with a polished steel nib in sizes EF-B, 1.1mm stub, or 1.5mm stub, a standard international converter, and five black standard international cartridges. 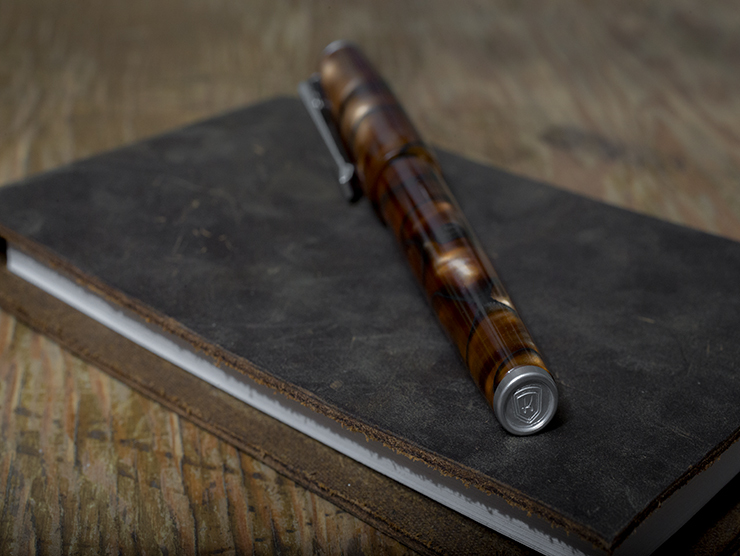 2-tone, black lacquer, titanium, and 14K gold nib upgrades are available for an additional charge when selecting the nib choice. 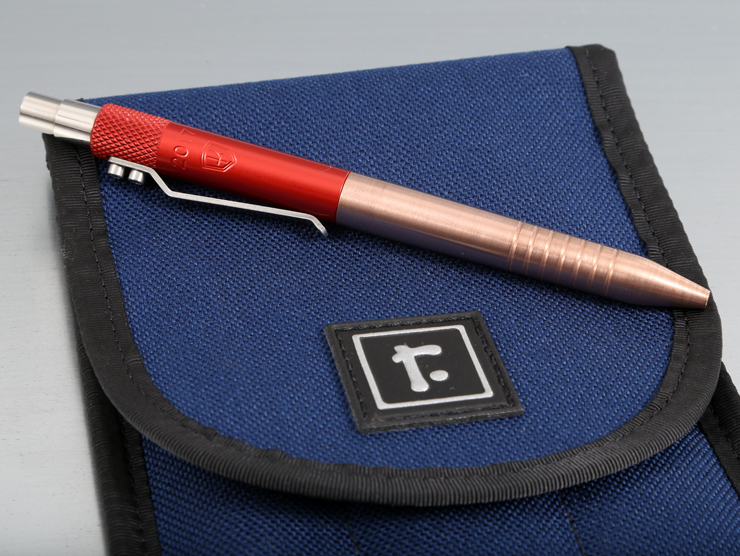 The Decograph 1702 – Elektron is available early at an introductory price to the Karas Pen Club Members from 11/10/17 to 11/14/17. The Decograph 1702 – Elektron will retail for $165.00 USD available at the Karas Pen Co website 11/15/17. Karas Kustoms is 9 years old! Karas Kustoms was started at the end of 2008. This year makes the 9th anniversary of that date. To commemorate turning 9, we introduce the 2017 Anniversary Edition Combo. 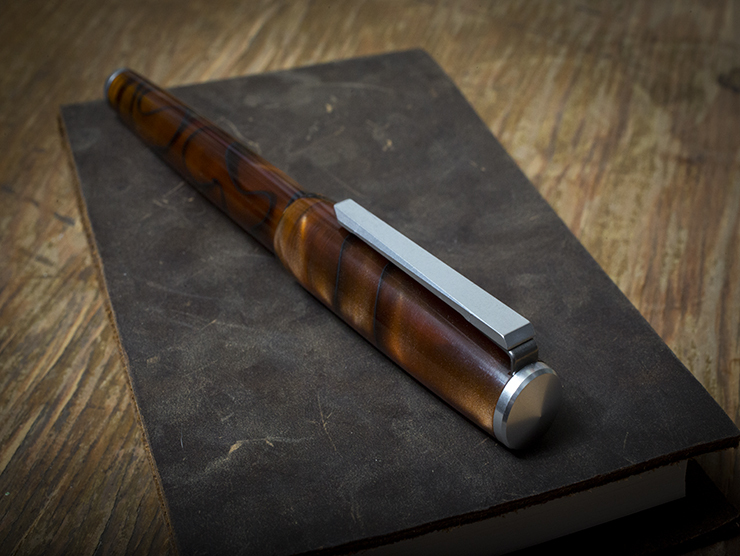 This combo is another collaboration with Karas Pen Co and Rickshaw Bagworks. The Anniversary Edition includes a special colorway Retrakt that features a matte finish, red upper barrel and a copper, grooved lower barrel. Engraving on the upper barrel of the pen is marked with the year and the Karas Pen Co logo. Rickshaw Bagworks supplies us with this custom EDC Field Case, in a Blue 1000D Cordura® nylon exterior, with a custom dye-sub printed polyester interior featuring the Arizona flag. Each EDC Field Case features space for a notebook(s), and up to 3 pens. The pen pockets are lined with a plush material to cushion and protect your pens from the rigors of daily carry. In the notebook pocket is a handy plastic sleeve for "scraps" (business cards, receipts, photos, stamps, stickers, emergency money, etc.). Approximate dimensions with notebook and three pens: 4.75 x 6.25 x 1.0 inches. The 2017 Anniversary Edition Field Case is manufactured by Rickshaw Bagworks in San Francisco, exclusively for us. All of the products in the 2017 Anniversary Edition Combo are manufactured here in the USA. This combo is in limited supply*, once they are gone, they are gone. The 2017 Anniversary Edition Set will retail for $120.00 USD. Wondering whether the Decograph can be eyedroppered? Or maybe you're wondering what eyedroppering a pen even is. In this How To video, Paul walks you through the process of turning your pen into a eyedropper filled pen. Enjoy! I really like the design. Thank you for sharing!